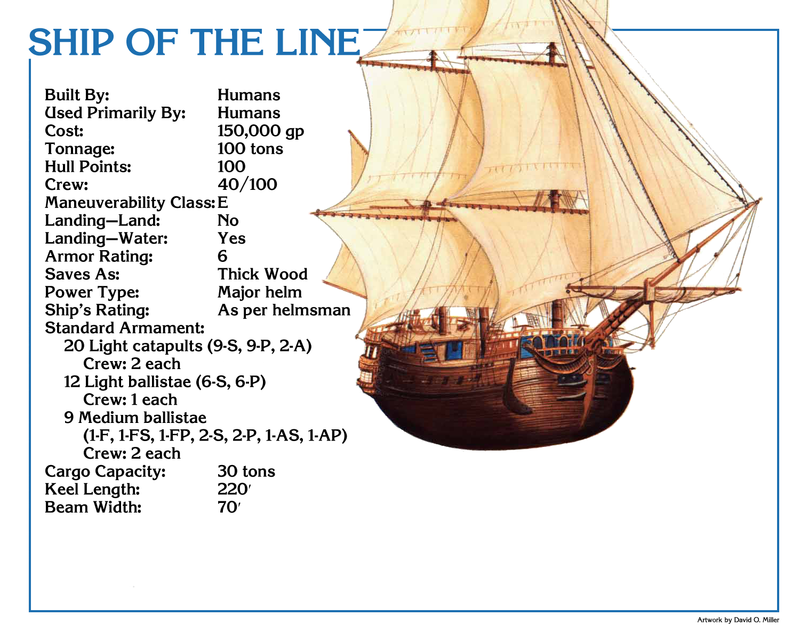 The first vessel up for conversion is the Alphatian Man-of-War, which I’ve named the Ship of the Line, due to the primary way the ship would be used in battle. This sailing vessel is of similar size to the Clipper, but wider. As such, I made it 100 tons; while it should probably be considerably larger (heck, the Clipper should be too), it seemed a good compromise which also allowed it to not need a special helm. At the bottom of the post are ship cards; the front is an altered card using the original art designed exactly as the Spelljammer cards are, while the back contains the original deck plans. I hope to eventually redraw them so they incorporate gravity planes and specialized Spelljammer terminology. Description: The Ship of the Line is one of the most heavily armed ships known in wildspace outside of those used by the giff. While modeled after a groundling sailing vessel, it is a spacefaring vessel through and through. The Ship of the Line is intended to be used with others of the same type, closely spaced into a battle line. Each vessel can then make a broadside pass, unleashing the brunt of its artillery in turn to pulverized an opposing fleet. Whereas some other ships are designed around a handful of heavy weapons, the Ship of the Line focuses on rapidly unleashing a large volley of smaller shot. 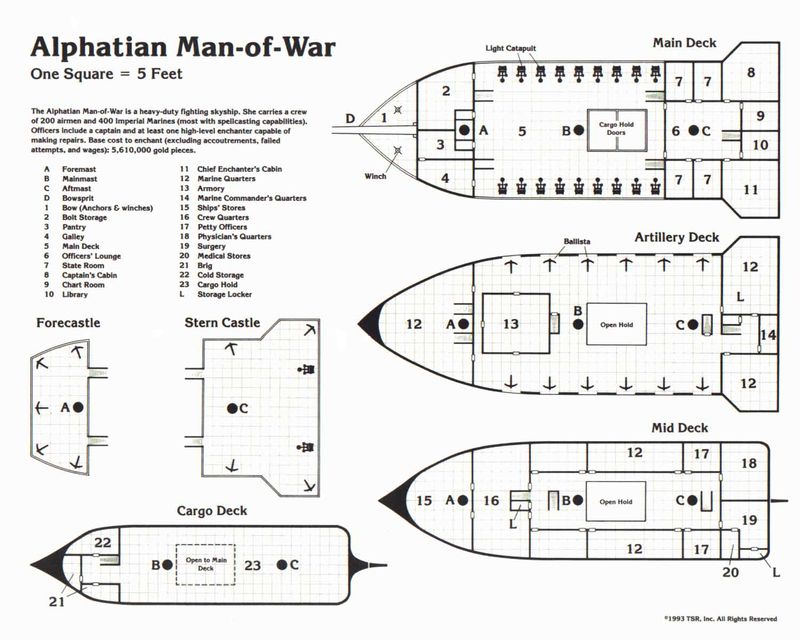 In order to man all weapons, the ship typically requires more crew than the air envelope can comfortably sustain; as such most ships are used in defensive fleets rather than in battle expeditions. When it needs to travel long distances, the crew manning the port and starboard weapons usually pull double duty, as the vessel rarely engages enemies in such a way as to require both port and starboard firing arcs. In planetary defensive fleets, the Ship of the Line will often include a large number of marines to be used in boarding purposes. The giff have attempted to replace the weapon contingent with a smaller number of bombards, but the structure can’t handle it, leaving the giff to stick to their similarly sized but narrower Clippers. Some ships have the majority of the weapons removed, typically all the light ballistae and all the light catapults except the aft-firing ones to increase cargo space to 50. Such ships are used as cargo haulers, but other ships specifically designed for cargo are generally preferred. Wow, this is a great project! Please keep them coming! I’m not currently running Spelljammer, but my daughter is interested, and we’ve got a campaign going in Mystara.